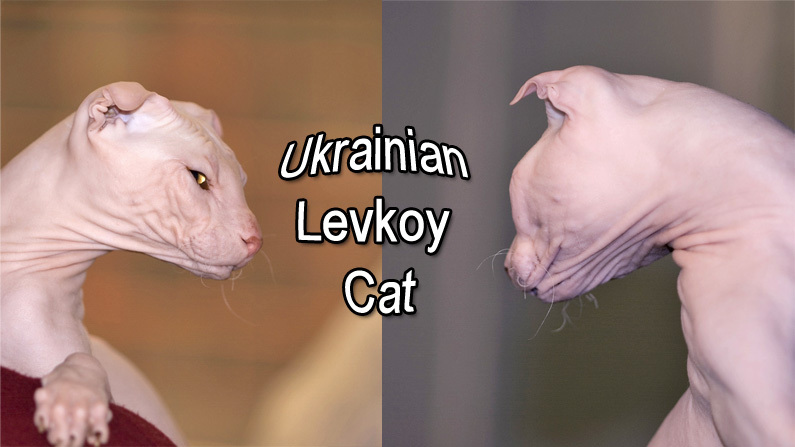 This is a guest post about the Ukrainian Levkoy cat by Liz Johnson from Hairlesscat.org. Ukrainian Levkoy cat. Sorry, I don’t know who took this picture. Please tell me and I will pay you. The first thing you’ll notice when you see one is the fact that they are hairless and have floppy ears. You’ll also notice that they have an angular wedge-shaped face that is stepped – almost like very shallow stairs. Levkoys look a bit like a regal and contemplative but slightly morose king. When they sit up they look composed and dignified. They’re midsized domestic cats with a lengthy, athletic build, beautiful almond shaped eyes, and a whippy tail. Their legs are slightly long. They can be completely bald or they can have extra short hair like peach fuzz. Levkoys can be fairly vocal – much like a Siamese. Ukrainian Levkoy Cat. The cat on the right is “Ukrainian gillyflower Helen Grig’s Pink Panther”. Color: cream tabby with white. Date of birth: 21/02/2008. Owner: E.Butomova. Club “Astra”, Moscow. By Photos by Nickolas Titkov. See originals on Flickr. Note about this photo collage by Michael. I have requested permission to use the originals from Nickolas and not received a response. I made the decision to publish here and have provided full credits and link. Problem? Please contact me. As with the Donskoy and Peterbald cats, the Ukrainian Levkoy is a descendent of a Russian bald rescue kitten known as Varya. In fact, one side of the gene pool comes from the Donskoy. The other comes from the Scottish Fold cat. The breed inherited its hairlessness from the Donskoy and the floppy ears from the Scottish fold. The cat originates from Ukraine. The Levkoy plant has folded leaves and the Ukrainian Levkoy cat has folded floppy ears that are similar in appearance to the plant’s leaves. So we have the perfect naming convention here – a person might guess the origin from “Ukrainian” and the appearance of the ears from “Levkoy”. These interesting cats were first registered by the International Cat Fanciers’ Association, which is based in Ukraine. They are a legitimate breed association due to the fact that they closely coordinate with the Cat Fanciers’ Association, Inc. based in the United States. The Levkoy has been around since about 2004, so it’s a relatively new breed. Lifespan is unknown since they haven’t been around long enough. If we were to infer based on their genetic makeup, they might live to be in their late teens or even into their 20’s. Breeders can be found in Ukraine and in Russia. Levkoys are gentle and sociable. They are energetic and love to play. They get along well with humans and various household pets, even dogs. The Levkoy enjoys the company of children as long as the children aren’t rough. Recessive genes can cause a whole string of health issues and some breeds of hairless cats do have a lot of medical problems. Unlike some of the other hairless cat breeds, Levkoys actually get their hairlessness from a dominant gene rather than from a recessive gene. As a result, the Ukrainian Levkoy is a healthy, robust breed. Like all hairless cats, Levkoys have special care needs. But they don’t have enough hair to absorb skin oil, protect the eyes, or keep the ears clean. They get cold easily so they need to wear cat jerseys and cat sweaters. They also require extra bedding areas. Levkoys need to be able to sleep where ever it happens to be the warmest at various times of day and night. They strongly prefer either being under the covers at night with their humans or sleeping on a heated cat bed. During the day they’ve been known to seek out warm laps from time to time. Levkoys are vulnerable to getting sunburn and skin cancer. They should be kept out of direct sunlight. Do you find the Levkoy’s appearance to be interesting and cute or do you find it troubling? 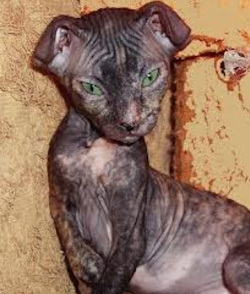 If you were to get a hairless cat, would you choose a Levkoy? Would you be willing to attend to a Levkoy’s special needs? Do you have any questions? This entry was posted in Cat Breeds and tagged cat anatomy, cat coats, hairless cats, russian cat breeds, Scottish Fold, sphynx cat, Ukrainian Levkoy Cat by Michael Broad. Bookmark the permalink. They are just awesome. I love their looks I am hooked, I am also a fan of the Chausie. Like many have expressed I don’t like the idea of fooling around with genetics.I am one who always when shopping looks for food that says non gmo I got very interested in health because I am a cancer survivor and have celiac and am prediabetic and that was a life changer for me.I am just trying to make it clear anything that harms an animal because of trying to fool with mother nature I havbe no use for. My question is this. Have any of the cat breed registeries accepted them? Have their been reports of health issues anyone have data on the oldest living THE UKRAINIAN LEVKOY is? Hi Lorrie, thanks for commenting. I will have to do a bit of research in order to answer your question. Please give me a day or two to do this when I will make another comment. Not all have the folding ears. From what ive read when breeding one is to have straight pointed and the other folded. I cant wait to bring mine home! Well done. They are rare cats. Is the breeder in America? I can’t tell. I would be very interested in getting a Ukrainian Levkoy. Are there breeders in the US? Good question, Michael 😉 . I am not sure. I would expect there to be one or two so if I were you I’d search with this search term “Ukrainian Levkoy breeders” and/or ‘Ukrainian Levkoy US breeders”. Good luck and thanks for asking. Sorry I can’t be of more assistance. It’s too early in the Levkoy game to say for sure but I can tell you that if there have been any reports of Osteochondrodysplasia in Levkoys, the reports must be pretty obscure. I know for a fact that Levkoys get their hairlessness from a dominant gene. I know that Scottish Fold cats are vulnerable to Osteochondrodysplasia but I haven’t seen any reports about the Levkoy suffering from the same. I know that two spontaneous mutations of dominant FD genes (the ones that create folded ears) were used to breed the Levkoy. So, since the folded ears come from purely dominant genes, my best guess is that they don’t suffer from Osteochondrodysplasia. But I do apologize if you find information to the contrary. I don’t want to say for certain, but I’m fairly confident that it wouldn’t be a concern. Agreed again. Breeding modestly and responsibly brings pleasure. Although even that could be questioned because of the so called cat overpopulation problem in the USA. There is no place in the world for extreme breeding but sadly there is a tendency to do it. It is a misguided activity. Marc makes a good point. I have a question too 🙂 Sorry. The Scottish Fold has a bit of history of a genetic disease associated with the folded ears: Osteochondrodysplasia. This is a severe disease. The genetic mutation that produces the folded ears also causes this illness. Is the Ukrainian Levkoy cat free of this health problem? You say the cat is healthy so I presume the answer is Yes. One question i do have is this: Apparently Scottish Fold kittens do not all end up with folded ears. Maru is a SF cat. I am not sure what the percentage is but some fold and some dont. So if the Levkoy cat originates in part from a SF do Levkoy cats also sometimes not have folded ears? Like SFs are they all born with normal ears and then after a short time some, but not all, have their ears begin to fold? Or for that matter, are they born folded? Great question. I’m going to go out on a limb here and offer my best guess as to whether or not all Levkoys end up with folded ears. My best guess would be “yes”. As far as whether all Levkoys are born that way, I would say “yes”. But don’t hold me to either answer. There isn’t any information that I can find that properly supports my answers but I can tell you that I haven’t been able to find any information to the contrary. One reason I think that they all end up with folded ears is that in every picture and video I’ve ever seen of a Levkoy – adults and kittens – have all shown folded ears. Another reason is that they have longer ears than SFs and I would think that they would have a greater tendency to fold. This is all theory that is supported by some fairly weak arguments so I apologize if you find that I am mistaken. The breed is so new that there is relatively little information compared to the more popular breeds. That’s true with all hairless cat breeds except for the Canadian Sphynx. There’s a bit more information on that breed. Touching and interacting with them changes one’s perspective about them. They look vulnerable at cat shows until you pick them up. Then they are adorable. She’s probably a complete prima donna and has her own wardrobe. The cat on the first photo has a human-like appearance, very intriguing and the eyes are beautiful. He or she is certainly looking at the camera in a knowing way. You can see the cat is thinking and I agree she looks a bit human. You can get cats that look like that. I love the head shape. Not real big on the hairless trend going on now, but love the cat no matter what their creators have done to them. I see so many new Munckin/curled/bobtailed/hairless wannabe breeds trying to get started it makes me sick. I wish we’d just nature make them for us. Absolutely. Nature is best. I have a kind of a dilemma with these cats. The mutation for hairlessness is natural. But if left to survive without the support of people the hairless cat would fail. Without fur a major part of the anatomy of the cat is missing. Fur is necessary for survival. It evolved that way. That is the bit I don’t like – creating a cat breed that is artificial in some way. I like the Sphynx. Is this cat as athletic and as friendly as the Sphynx? I am sure this cat would turn heads if he was outside. A trip would have to be under close supervision because people would notice this cat and it would cause quite a stir. Anything could happen. Thanks for a really nice article Liz. Great article. Thank you for the compliment and for the invitation to write an article for your site. Yes, the Levkoy is about as athletic and friendly as the Canadian Sphynx. There’s no doubt that taking one out on a harness would be an attention magnet. They look interesting and distinct. If a guy wanted to pick up a girl, he should adopt a Levkoy and take him for walk on a leash at the local covered shopping mall; provided the Levkoy was happy about it. Guaranteed to find a girl.